The Elemental Apples Mod, created by the developer: “OfficiallyPolarFluid”, adds in different kinds of apples that all have unique effects and characteristics. 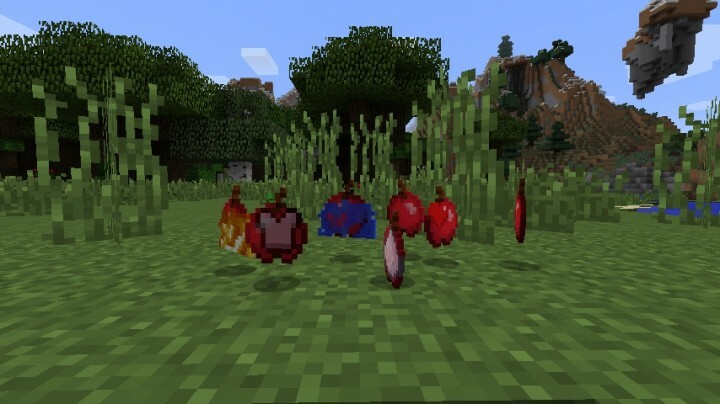 Included in this mod, the fire apple, the water apple and the speed apple. The mod was only recently released, 5 days ago to be exact, but has already received many many downloads. The mod is compatible with Minecraft 1.7.10 and can be installed on servers. There is no real way to ‘use’ the Elemental Apples Mod. You first of all need to download the mod and install it with the help of Minecraft Forge. If done correctly then all of the mod’s features should automatically be enabled, all you need to do is find them or craft them! There are currently no public video showcases available for the Elemental Apples Mod, sorry about that! The fire apples gives the player fire resistance, the water apple gives you water breathing, the speed apple gives you the swiftness perk, the invisibility apple makes you invisible. There are more apples in the mod, but you’ll have to download the mod to find out. In the mod also, the enderman-skeleton crossbreed and the morbid harvester. There are currently no public changelogs for the Elemental Apples Mod, the entire mod was released at the same time!